Last year when my three year old asked for gum, I reminded him that “gum goes in your mouth or in the trash.” We had had a few instances when gum had found its way to other places and at that time he had a tendency to to play with gum. A little while later, as my husband and I were trying to cook dinner and my one year old needed to nurse, we heard a cry of horror. When stretching his gum, our son had managed to get it in a circle around his head, from his mouth to the back of his hair, and the gum had firmly attached itself all the way around. The line of gum was not coming out of his hair or off of his skin. My son had wanted a hair cut anyway, so he and I decided to gut the gum out and then for me to finish cutting his hair. That left the line of gum on his skin. Having read a long time ago that peanut butter is good for this, I told my husband he was in charge of the peanut butter extraction. He looked at me as if I were nuts (pun intended) and said that he didn’t think it would work and that our son would have to wait for it to wear off (it was extremely sticky gum). I waited a day, and then two, as I watched as the line on our son’s head become increasingly darker with dirt. Finally, I couldn’t take it anymore and pulled out the peanut butter. I grabbed a cloth wipe, wet it, and proceeded to spread peanut butter on my son’s face, his head cradled in my lap. As I gently rubbed, and my son erupted in giggles, the gum quickly came away. 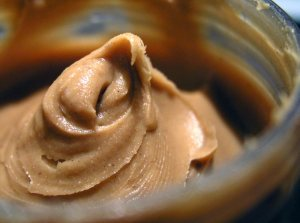 It’s the oil in peanut butter that counteracts the stickiness of the gum. I could have grabbed another type of oil: olive, canola, coconut, or even my sweet almond oil. However, none of those seemed quite as much fun as peanut butter. Playful parenting isn’t just about parenting in a fun way to connect with your children; it’s sometimes about keeping a sense of humor. 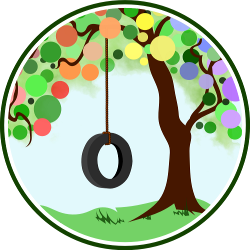 Post rewritten from one previously published at Living Peacefully with Children.